All rentals face the ocean with scenic balconies. There's a pool for every season and a sun deck to soak in the warm weather. Garden City Beach has that laid back beach town vibe. You're steps from the beach and nice stroll to the Pier at Garden City. It's much quieter here than on the main strip of Ocean Boulevard. Don't let the weather interrupt your swim plans, the resort has an indoor pool. 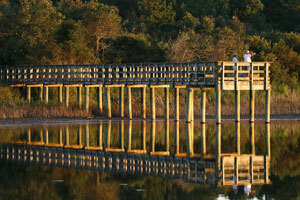 Atalaya Towers is located in Murrells Inlet, just south of Myrtle Beach. The resort has a slower beach town vibe. Away from all of the crowds of the main stretch of Myrtle Beach, yet close enough to still experience everything in the area. When not swimming in the warm coastal waters of Murrells Inlet, or lounging on the sand, the outdoor pool and sundeck are a great place to hang. Work on your sun-kissed look, or relax with your latest read. Take advantage of the BBQ grills for a fun family cookout and let the kids assist by carrying burgers, hot dogs, buns, and condiments. In the off-season, the indoor pool is perfect for laps or a quiet swim. Three-bedroom condos sleep eight guests are quite large with spacious living rooms and dining areas, air-conditioning, and all condos face the ocean, so you’ll never have a parking lot view, ever. Bring the family along to Kroger to pick up groceries for your full kitchen. The little ones will be begging to help you make your famous chocolate-chip pancakes for breakfast. Let them be in charge of the chocolate-chip distribution, and don’t worry if they end up covered in the batter; you’ll have an in-suite washer/dryer. After a fun day exploring the area, return to your condo for family movie night thanks to the cable TV with DVD player. Pack favorite movies from home, pop some popcorn and gather everyone on the couch. Check out the best views of Myrtle Beach on the SkyWheel; it’s almost two-hundred-feet tall. The climate-controlled gondolas ensure that the whole family can ride in comfort. Up for a day of shopping? You’re in luck! Broadway at the Beach features a variety of shopping and dining options. Pick up a gift for your four-legged family member back home at Reigning Cats and Dogs. Broadway Magic has magic tricks and supplies. Kids will love Toys & Co and Build-a-Bear. Create your own unique piece of jewelry at Pick a Pearl. The Mole Hole offers gifts, collectibles, and jewelry. Hungry? Joe’s Crab Shack, Key West Grill, and Señor Frogs are just some of your options. Tanger Outlets Myrtle Beach offers name brand shopping at discount prices. Brands include Lululemon, Justice, Michael Kors, Kate Spade, Coach, Calvin Klein, American Eagle, and Vera Bradley. Grab a burger at Five Guys or Steak n Shake and stop by Ben and Jerry’s for dessert.